When I became pregnant with my first child I was already living a #lifefromscratch. I ate organic nourishing food, used clean beauty products, and DIY’d many of my home cleaning supplies. So, naturally I was concerned about anything and everything I was going to use for my baby. I must have read a dozen books, sampled armfuls of baby bath products, and tested and re-tested diapers. One of the most concerning things to me was the lack of truly natural baby wipes. I looked over the ingredients from the most widely available “natural wipes” and found many toxic ingredients. This chemical is a preservative that releases formaldehyde. As you can guess, the formaldehyde is not something even grown people should be putting on their skin, let alone infants. It is an allergen, irritant, and most importantly causes cancer (source). Formaldehyde itself is rated the worst score possible on Skin Deep — a 10. Sodium hydroxymethylglycinate scores a 6 (source). Another preservative that is not as bad as the previous offender but still strongly linked with skin irritation (source). A foaming agent; while it scores a 0 on Skin Deep, this is because they have zero data on it. However, after doing my own search on NCBI I found two articles liking it to allergic skin reactions (source). And don’t even get me started on wipes like Huggies and Pampers — they are a toxic soup of parabens, fragrances, and skin irritants. Oh these poor baby’s butts! No wonder diaper rash is so common. So, then and there I decided to forgo packaged wipes altogether. I went into my kitchen and started concocting all sorts of baby wipe sprays. The recipe I came up with I have used through two children, and thank myself every time for doing so. I make a batch about every two weeks and keep it in a spray bottle for easy use. The only other step left is purchasing the reusable wipes, which are easily found online. I find it best to have an assortment of brands on hand so that I can have different textures for various “jobs.” Once I have used a wipe I simply toss it into the Wet Bag I have hanging on my door knob. Weekly, I throw all the wipes in the wash — easy as pie. For those concerned about the stink of dirty wipes hanging around in a bag, don’t be. I have the terrible curse of an incredibly strong sense of smell, and not once through diapering two children have I smelled the Wet Bag. 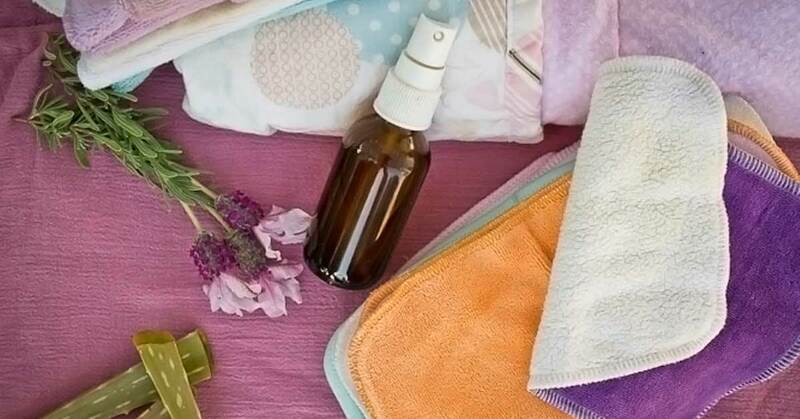 Another bonus about using DIY spray and reusable wipes is how much money you will save. 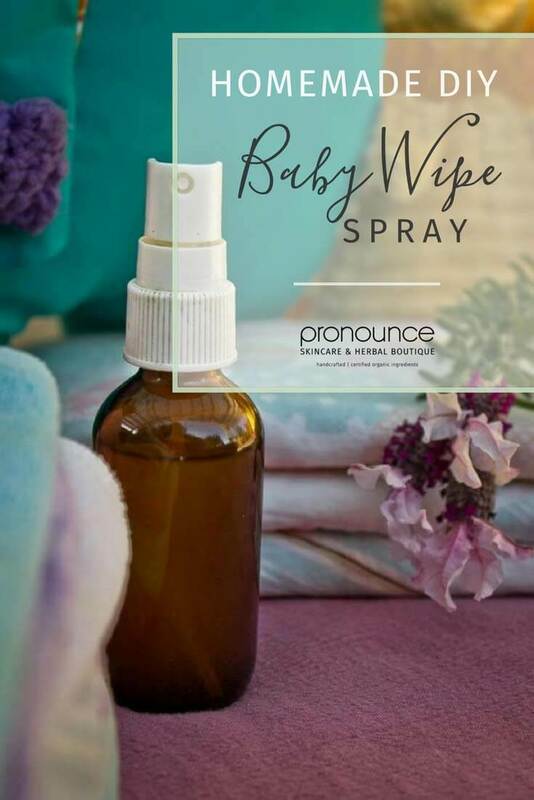 A 2 oz bottle of spray costs mere pennies to make and once you buy a stack of reusable wipes they will last you indefinitely…certainly through multiple diapered children. This beats buying the jumbo box for $18 each month. Plus it’s environmentally friendly to boot. You can’t get any more #lifefromscratch than this. Packed full of nutrients which calm and soothe irritated skin. It heals any broken skin rapidly, plus moisturizes. Aloe also helps the other ingredients absorb quickly. You want a thin, watery aloe vera like this. The gel will not work. just a small portion of the mixture; too much and the spray will become too sudsy to leave on the skin without washing off. However, in a small amount it aids in removing the grime stuck on the skin. For this recipe, I prefer not to use Dr. Bronners because it irritated my daughter’s skin. I like this one instead. 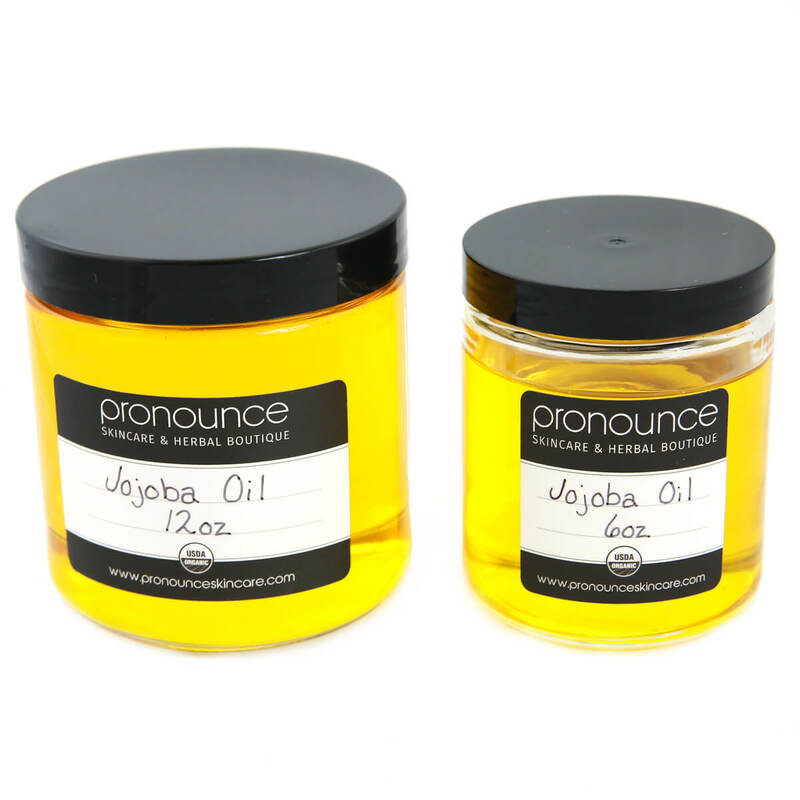 The oil of choice aids in moisturization and calming the skin. 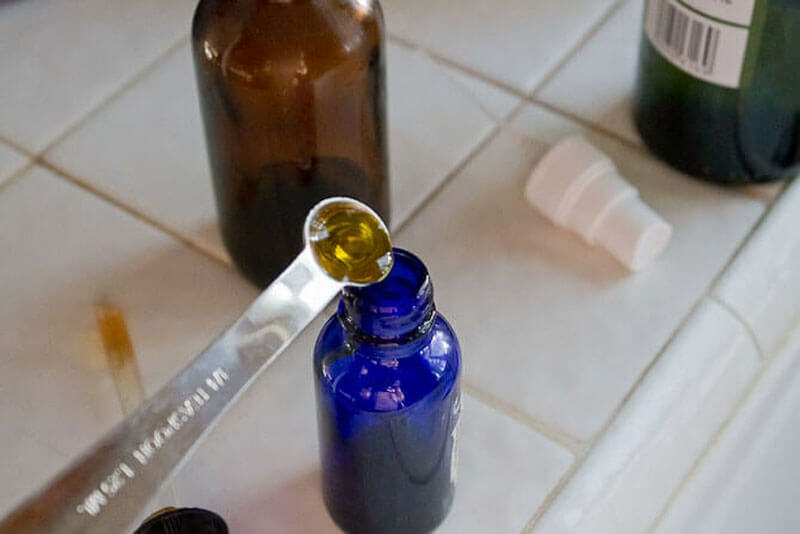 Click here for an in-depth look at carrier oils and how they are used. 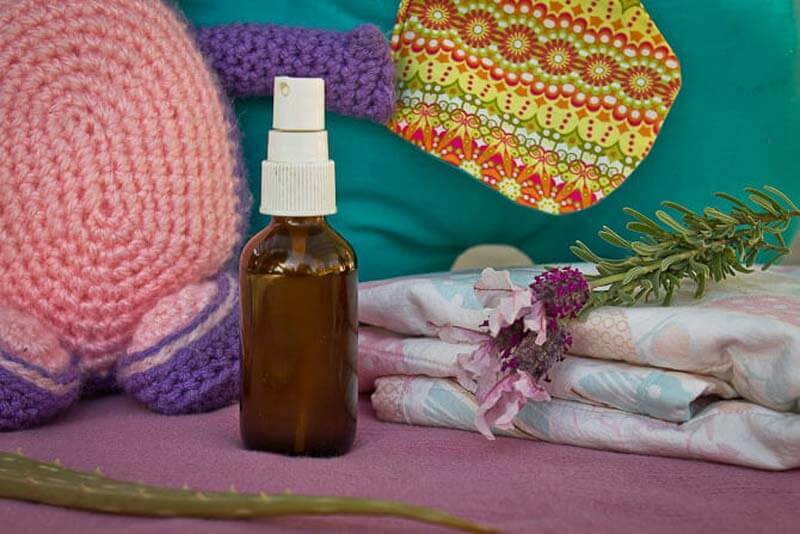 Lastly the essential oils are key in having an effective formula. The tea tree is antimicrobial which wards off diaper rash and the lavender is calming to the skin as well as the baby — plus it’s antibacterial. 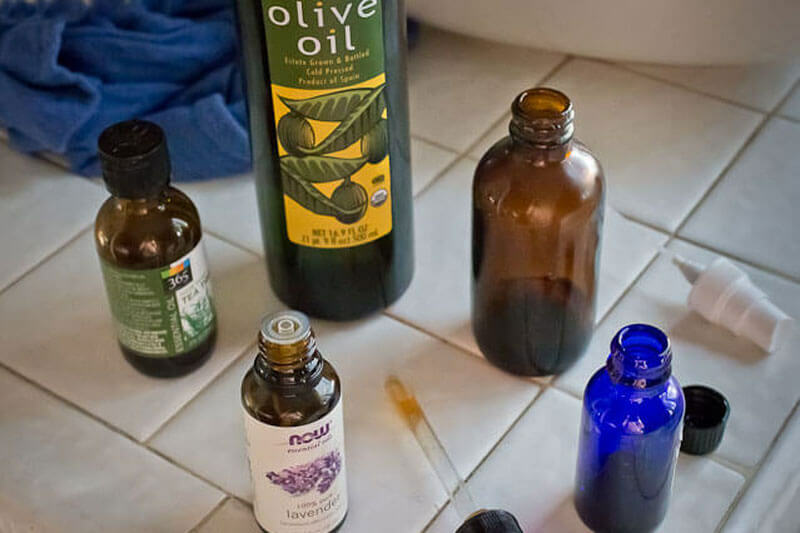 At Pronounce Skincare we love these essential oils. 1 Tbs aloe vera (I use this brand because it’s thin like water with no nasty additives. This recipe will not work with aloe vera gel, like Pronounce Skincare’s aloe vera gel). Mix all the ingredients, except the water, together directly into the bottle. Add the water last, just enough to fill the bottle to the top. Swirl gently to mix, don’t shake or it will foam. With each use gently swirl and/or invert to combine ingredients. Your baby’s bottom will be clean, chemical free, and soothed. Rashes and irritation may be a thing of the past and you will praise the Diaper Gods each time you pass the wipes section without spending a penny. Want to make truly natural baby wipes? Please, head on over to my Pronounce Skincare Shop where I sell some of the ingredients you will need to make it. While you are there, please look around at all of my other skincare creations. I love making them for my family and for you! Limited Time - Order $75+ and ask for a FREE sample Facial Powder (light, medium, or dark)! Must ask in the notes section of your order.